The Pennsylvania Party is On — PJKoenig Golf Photography PJKoenig Golf Photography - Golf Photos For Those Who Love The Game. After, I finished up in Maryland, I wasted zero time getting over into Pennsylvania. From a morning 18 in Maryland to an afternoon 18 at Wyncote in Pennsylvania, the state transition was a smooth one. I even ran into an excited twosome that were fired up to be the first golfers to sign the RGV Tour guest book in Pennsylvania. The second round in the state was one of the state's best. I put Lancaster CC towards the top of the "best surprise" category. This place is magic and easily one of the best places to play in the state. After that it was time for Billy Black and the legend of Stonewall. Billy was my caddy for the day. Billy is 14 years old and he is a total animal on the bag. What Billy lacked in experience, he made up for enthusiasm. We even did a little work on the "Caddies of The RGV Tour" photo series. The idea here is to present caddies in suggestive poses on the golf course. Then we basically turn it into a calendar and Blam! Retirement fund! With the Gil Hanse designed French Creek just across the street from Stonewall, the tour was not going to not play 36. Having the opportunity to play a lot of different courses designed by the same architects makes these courses even more fun. After a while, you start to feel like you know these guys and become familiarized with the challenges and styles that they present with each course. It is like visiting an old friend... an old friend that you have never met. Like any artist, you can see how architects have matured over the years. French Creek was one of Hanse's earlier designs opening for play in 2004. When visiting Philly on a golf trip, It won't take you long to realize that the city is packed with a ton of golf talent. I joined up with some serious gamers for an early morning round at Makefield. I was easily the hack of the group in our power foursome with Dan, Patrick, and Kevin. My personal highlight of the round came after I topped my 3 wood into the ditch on 18. Disgusted, I threw down another ball and popped it up on the green to 2 feet. It was one of the best bogey finishes I can recall. Dan approaches 18 after hitting it 900 yards off the tee. The tour's other Patrick poses hard. 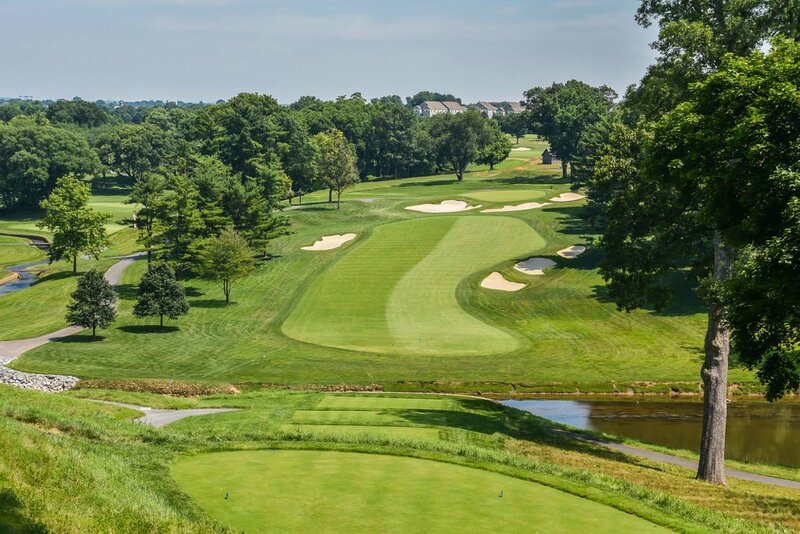 One of the few solid options for public golf in the Philly area is the Golf Club at Glen Mills. I met up with one of the tour's most passionate players, a man by the name of Mike Zinda. Mike has cataracts and it can be difficult for him to see his ball. Most of the time he just goes by feel and hopes to find it out in the fairway. Imagine playing by yourself and saying "I think that went left" and just hunting for it in the rough? Mike doesn't mind at all though and I was happy to hunt down his golf shots with him. The limitations that golfers overcome to play the game is always inspiring. Like a true golf nut, Mike would make a return trip to the tour at Neshanic Valley. It was the 4th of July and it was time to celebrate America. The RGV Tour chose to celebrate with golf, hot dogs, and USA pin flags at Huntingdon Valley Golf Club. The flag game is actually quite fun. Every player gets a flag and gets a total number of strokes based on handicaps. If you are an 11 handicap, you would get 83 shots, I got 73 shots as a 1 handicap. Then you just put your flag in the ground where you ball comes to rest after 83, or 73 shots. If you make it past 18, you start on 1 and just keep playing until you run out of shots. The winner is whomever makes it the furthest. With several hot birdies out of the gates, it looked like I was gonna have to play an extra 9 holes. However, reality set in and I only made it to 17 green. The good news is that our group was seriously fun and we raised a healthy sum of $$ for the First Tee of Greater Seattle. The original $10k goal is going to be reached well ahead of time. The RGV Tour consistently hunts down and attracts the biggest golf nuts in the world and in Pennsylvania, we found one of the biggest golf nuts the world has to offer. I am talking about Author Tom Coyne who would quickly become one of my favorite guests on the RGV Tour. Tom walked 40 courses and the entire country of Ireland for his NY Time's Best Seller "A Course Called Ireland" and played 111 courses in two months for "A Course Called Scotland." So Tom is perfectly suited for life on the RGV Tour... he is my cup of tea. None of us brought our A games to Waynesborough Country Club but we did have an A+ time. I sat down with Tom for a lively discussion in the Bride's room at Waynesborough Country Club. This RGV Tour Podcast is worth a listen. Tom has also just released "A Course Called Scotland" and it would be wise to pick up a copy here. Up next was another Philly area surprise. With the quality of golf courses being so high in the area, courses like White Manor were not on my radar before visiting the area. Readers please note, that this course should definitely be on your Philly golf radar. We ended up finishing in the rain. But it was more like making birdies and clutch putts down the stretch like golf animals. Eventually the rain would give up, but The RGV Tour would not. We never stop golfing on the RGV Tour. Never. RGV Tour player Kevin and I headed down the road to take on Applebrook, another fantastic Gil Hanse design In the area. We made a handful of birdies and finished up the day of 36 with plenty of sun left in the day. Fittingly, I scarfed down a Philly cheesesteak sandwich on my way out Pennsylvania. The RGV Tour leaves every state saying, "I will miss this state." But Pennsylvania, I will miss you more.